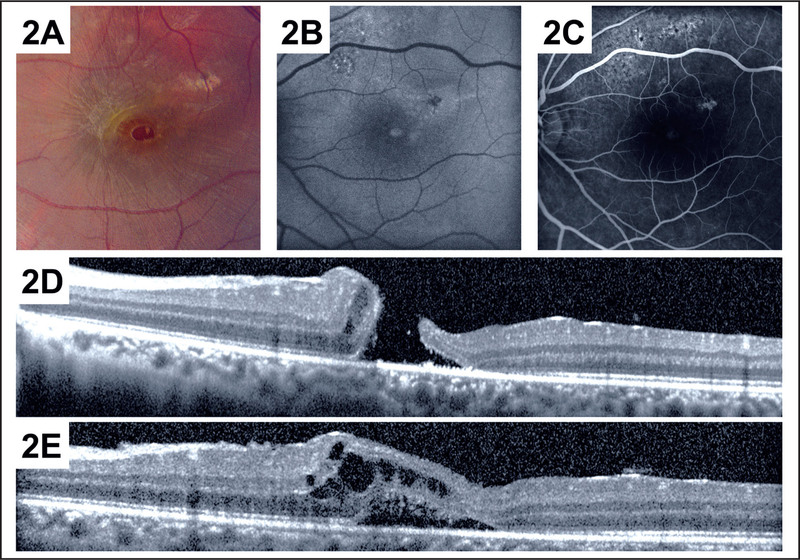 A child with a traumatic full-thickness macular hole was imaged perioperatively using spectral-domain optical coherence tomography (SD-OCT). Intraoperative imaging using a portable SD-OCT device equipped with a handheld probe demonstrated the full-thickness macular hole to be nearly completely closed following vitrectomy and internal limiting membrane peeling. Air was used as a tamponade agent and prone positioning was used postoperatively for 2 days. SD-OCT imaging confirmed closure of the full-thickness macular hole 5 days and 1 month postoperatively. From the Department of Ophthalmology, Bascom Palmer Eye Institute, University of Miami Miller School of Medicine, Miami, Florida. Supported by the Heed Ophthalmic Foundation (CCW), National Institutes of Health center grant P30-EY014801, and an unrestricted grant to the University of Miami from Research to Prevent Blindness, Inc., New York, New York. Funding sources had no role in design or conduct of this research. Address correspondence to Audina M. Berrocal, MD, Bascom Palmer Eye Institute, 900 NW 17th Street, Miami, FL 33136. This report describes the imaging of a patient with a traumatic full-thickness macular hole perioperatively using a portable spectral-domain OCT (SD-OCT) system equipped with a handheld delivery probe. A 14-year-old boy presented after a self-inflicted blunt injury to the left eye with a paint ball discharged from a gun at close range. He complained of decreased vision and pain in the left eye. Best-corrected visual acuity was 20/20 in his right eye and hand motions in his left eye. There was no afferent pupillary defect and intraocular pressure was normal in both eyes. Results of anterior segment and fundus examinations of the right eye were normal. Examination of the left eye revealed no evidence of globe rupture with a clear cornea, moderate traumatic hyphema, a clear crystalline lens, moderate vitreous hemorrhage, areas of commotio retinae in the posterior pole, and a full-thickness macular hole (Fig. 1). Figure 1. Baseline Fundus Images of the Left Eye. (A) Fundus Photography Shows Diffuse Vitreous Hemorrhage, Most Dense Nasally to the Optic Nerve Head. (B) Fundus Photography Shows Vitreous Hemorrhage and a Full-Thickness Macular Hole Involving the Central Macula. Three months later, after resolution of the hyphema and clearance of the vitreous hemorrhage from the visual axis, best-corrected visual acuity in his left eye was 20/200 and a stage 3 full-thickness macular hole involving the central macula was apparent (Fig. 2A). There was no posterior vitreous detachment. Fundus autofluorescence of the left eye revealed increased autofluorescence centrally consistent with intact retinal pigment epithelium underlying the retinal hole and multifocal abnormalities superiorly consistent with prior trauma (Fig. 2B). Fluorescein angiography of the left eye revealed patchy areas of irregular hyperfluorescence at the level of the retinal pigment epithelium also consistent with prior trauma (Fig. 2C). SD-OCT (Spectralis; Heidelberg Engineering, Heidelberg, Germany) illustrated the full-thickness macular hole and associated areas of subretinal and intraretinal fluid (Figs. 2D and 2E). Figure 2. Preoperative Images of the Left Macula. (A) Fundus Photography Shows a Full-Thickness Macular Hole Involving the Central Macula. 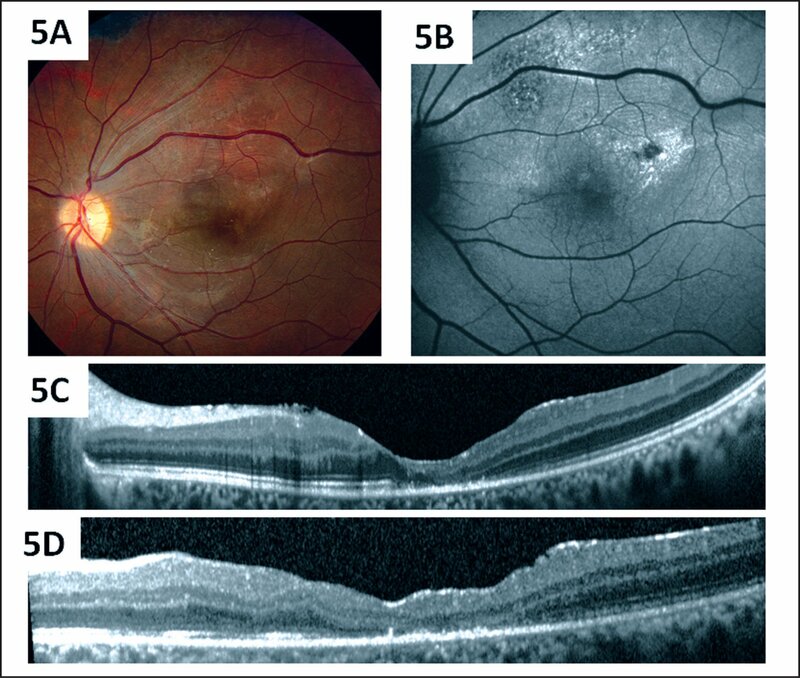 (B) Fundus Autofluorescence Shows Increased Autofluorescence Centrally and Multifocal Abnormalities Superiorly and Temporally. (C) Fluorescein Angiography in the Venous Phase Shows Mild Central Hyperfluorescence and Patchy Superior Irregular Hyperfluorescence at the Level of the Retinal Pigment Epithelium. Spectral-Domain Optical Coherence Tomography (spectralis; Heidelberg Engineering, Heidelberg, Germany) Shows a Full-Thickness Macular Hole (D) and Associated Subretinal and Intraretinal Fluid (E). The patient was brought to the operating room where examination under anesthesia and cross-sectional imaging of the retina using an SD-OCT system with a handheld probe (Bioptigen, Research Triangle Park, NC) again documented the full-thickness macular hole (Fig. 3; video 1 available online). A 23-gauge core vitrectomy was performed and residual vitreous hemorrhage was removed. The vitreous was visualized using triamcinolone acetonide (Triesence; Alcon Laboratories, Fort Worth, TX) to confirm the creation of a complete posterior vitreous detachment. The internal limiting membrane was peeled using a diamond-dusted Tano brush and end-grasping forceps from an approximately 1 disk diameter area circumferentially around the full-thickness macular hole following staining with indocyanine green. Intraoperative SD-OCT imaging at this time, while the patient was still on the operating table, revealed near complete closure of the full-thickness macular hole (Fig. 4; video 2 available online). Fluid–air exchange was performed and the patient was placed in a prone position for 2 days. Figure 3. Intraoperative, Pre-Vitrectomy, and Pre-Internal Limiting Membrane Peeling, Spectral-Domain Optical Coherence Tomography (SD-OCT) (Bioptigen, Research Triangle Park, NC) Analysis of the Left Eye. (A) SD-OCT Through the Fovea Shows the Full-Thickness Macular Hole. (B) SD-OCT Just Superior to the Fovea Shows Subretinal and Intraretinal Fluid. (C) SD-OCT Just Superior to (B) Shows Intraretinal Cystic Fluid. Figure 4. Intraoperative, Post-Vitrectomy, and Post-Internal Limiting Membrane Peeling, Spectral-Domain Optical Coherence Tomography (SD-OCT) (Bioptigen, Research Triangle Park, NC) Analysis of the Left Eye. (A) SD-OCT Through the Fovea Shows near Complete Closure of the Full-Thickness Macular Hole with Persistent Subretinal Fluid. (B) SD-OCT Just Superior to the Fovea Shows Subretinal and Intraretinal Fluid. 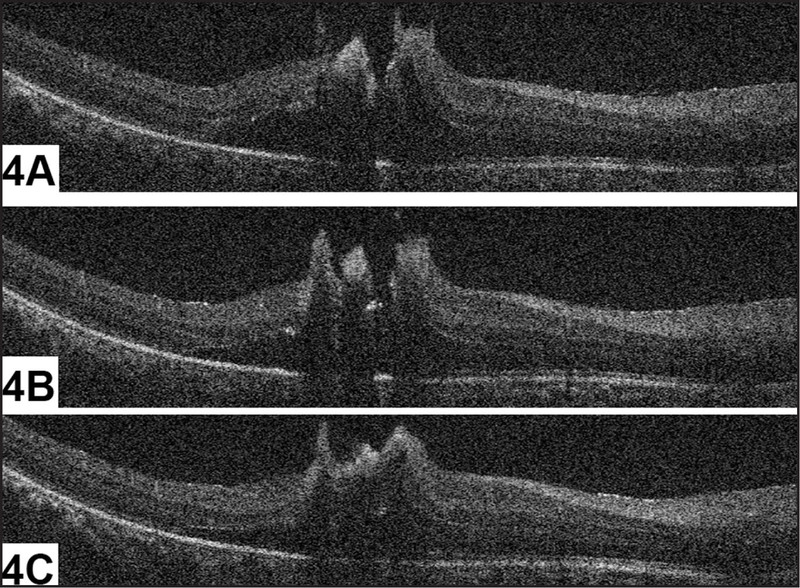 (C) SD-OCT Just Superior to (B) Shows Subretinal and Intraretinal Fluid. Postoperative best-corrected visual acuity in the left eye was 20/200 on postoperative day 5 and 20/40 at postoperative month 1. 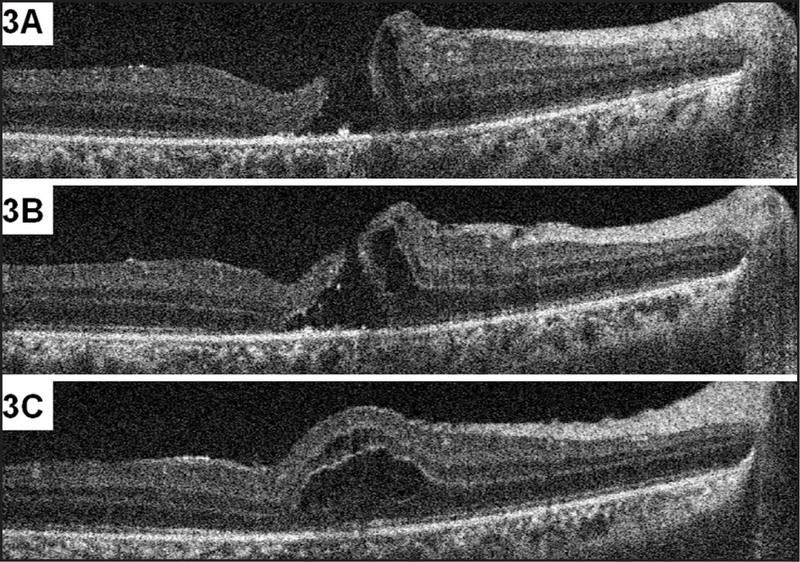 Fundus photographs, fundus autofluorescence, and SD-OCT confirmed closure of the full-thickness macular hole (Fig. 5). Figure 5. Postoperative Images of the Left Macula 1 Month After Surgery. (A) Fundus Photography Shows Closure of the Full-Thickness Macular Hole and Areas of Pigmentary Changes. (B) Fundus Autofluorescence Shows Normal Autofluorescence Centrally and Persistent Abnormalities Superiorly and Temporally. (C) Spectral-Domain Optical Coherence Tomography (SD-OCT) (Spectralis; Heidelberg Engineering, Heidelberg, Germany) of the Fovea Shows Full-Thickness Macular Hole Closure with Loss of the Normal Lamellar Retinal Architecture Centrally and Loss of Reflectivity Along the Outer Retina Along the Reflective Band Corresponding to the Photoreceptor Outer Segment/inner Segment Junction. (D) SD-OCT Just Superior to the Fovea Shows an Irregular Foveal Contour and Disruption of the Outer Retinal Architecture. Intraoperative SD-OCT illustrated this traumatic full-thickness macular hole to close nearly completely immediately after vitrectomy and internal limiting membrane peeling. A portable SD-OCT device equipped with a handheld probe facilitates use in clinical scenarios that were previously not as amenable to such imaging. The SD-OCT used in this study employed an 840-nm center wavelength and achieved an axial resolution of approximately 3 μm in tissue with an imaging depth of 2.2 mm. We routinely use 16% octafluoropropane as a tamponade agent and prone positioning postoperatively for 10 to 14 days after idiopathic and traumatic full-thickness macular hole repair with internal limiting membrane peeling. This methodology has been validated and is associated with a single operation anatomic success rate of greater than 90%.4 However, this length of prone positioning is associated with significant morbidity and may not be necessary in every case, as suggested by others.5–8 In the current case, given anatomic closure of the hole observed intraoperatively, we used a much shorter acting tamponade agent, air, and postoperative prone positioning for only 2 days. The intraoperative changes in the size and configuration of the traumatic full-thickness macular hole seen in this case may be due to immediate relief of traction, with cortical vitreous removal relieving anterior-posterior traction and peeling of the perifoveal internal limiting membrane peeling relieving tangential traction. The value of such imaging in our surgical management of this important disease is yet to be fully appreciated, but such intraoperative changes in macular anatomy may allow identification of patients who require little or no postoperative prone positioning. Additional studies are indicated to determine whether intraoperative OCT is able to predict final surgical success or allow avoidance of prolonged prone positioning for some patients. Gass JD. Idiopathic senile macular hole: its early stages and pathogenesis. Arch Ophthalmol. 1988;106:629–639. Kelly NE, Wendel RT. Vitreous surgery for idiopathic macular holes: results of a pilot study. Arch Ophthalmol. 1991;109:654–659. Tornambe PE, Poliner LS, Grote K. Macular hole surgery without face-down positioning: a pilot study. Retina. 1997;17:179–185.